When you need a dessert for a lot of people, this is it. This beautiful pie is baked in a rimmed sheet pan and serves at least 12 people. It's perfect for the Fourth of July because cherries are in season right now. If you have even more people to feed,you can even make two pies - one with cherries and one with blueberries for a real Fourth of July look. Don't be scared of making this pie dough from scratch. When I say it is easy, it is very easy - if you have a food processor. I can make pie dough in under one minute in my food processor. All you do is throw in the dry ingredients, pulse, put the butter through the feed tube, pulse, and then add the water and pulse until it all comes together in a ball. Done. And I have a fool proof tip for rolling out pie dough. Most people flour their working surface and then roll out the dough and end up getting frustrated. Lay a piece of plastic wrap on your working surface, dust with flour, place your dough on that, dust dough with flour, and then place another piece of plastic wrap on top of the dough. When you roll out your dough between two sheets of plastic wrap, you won't believe how much easier it is. And if you've adequately floured them, they just peel right off. The plastic wrap trick also makes it easier to roll up your dough around your rolling pin for easy placement on the sheet pan. 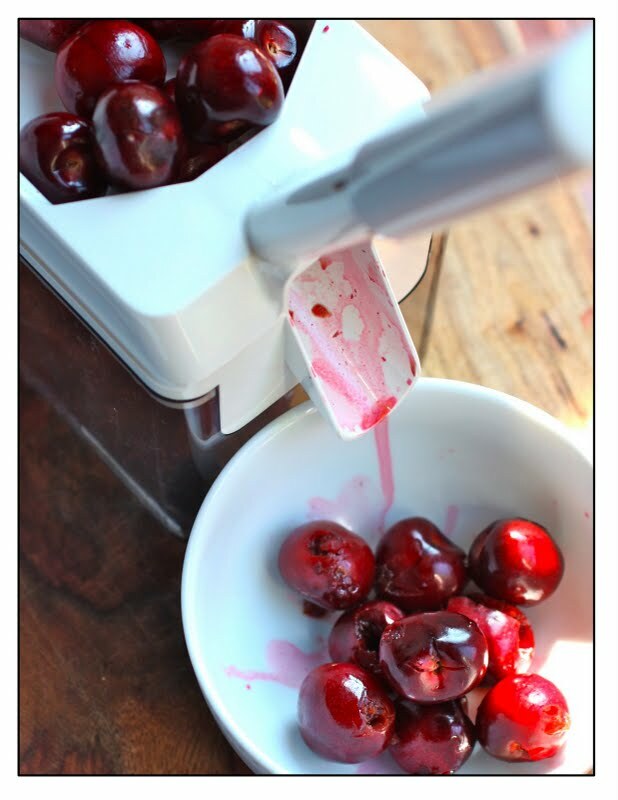 When I had to pit cherries in the past, I used a handheld cherry pitter and it was a mess and slow and difficult. This cherry season, I purchased the Leifheit Cherry Pitter and what a difference this makes. It's very quick to pit a batch of cherries and I don't have to wear an apron to do it. Place the flour, salt and sugar in the bowl of a food processor and pulse to combine. Add the butter and pulse until the mixture resembles coarse crumbs, about 10 seconds. With machine running, slowly pour the ice water through the feed tube until the dough just comes together in a ball. Divide the dough into two pieces, one slightly larger than the other. Flatten a little, dust with flour and wrap the dough in plastic wrap and refrigerate at least one hour or overnight. Combine all ingredients in a large bowl, stir to combine, set aside. Preheat the oven to 375 degrees. On a lightly floured surface, roll out the larger piece of dough into a rectangle, a little bit larger than your baking sheet. The original recipe calls for a 15x10 baking sheet, but I used a 13x10 quarter sheet pan. To make this easier, place a piece of plastic wrap on your working surface, dust with flour. Place pie dough on top, dust with flour and place another sheet of plastic wrap on top. When your dough is the right size, lay your rolling pin on top of the top sheet of plastic wrap. 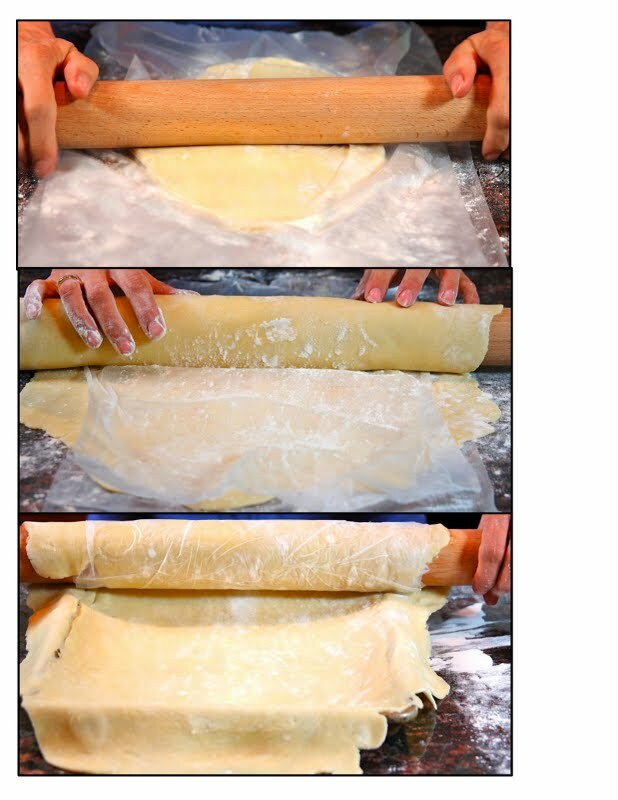 Start rolling the dough around the rolling pin, leaving the bottom sheet of plastic wrap on your working surface. Dust the dough around the rolling pin as you go, so it will not stick to itself. Lift rolling pin over your baking sheet on one end and unroll dough. Remove plastic wrap from top. Fit into your rimmed baking sheet, pressing into corners (pastry will hang over sides). Spread filling into pie shell. On a lightly floured surface, roll out remaining piece of dough to the size of your pan. Using same method as above, drape dough over filling. Fold edge of bottom dough over top dough. Pinch edges to seal Prick the top dough all over with a fork. Brush the entire surface of the pie with the cream and sprinkle with the sugar. Bake until crust is golden brown about 40 to 55 minutes. Transfer to a wire rack to cool just until the pie is still warm to the touch. Serve warm or a room temperature. Cut into 12 pieces. Slab pie can be kept at room temperature, loosely covered with plastic wrap, for up to 2 days. make ahead tip: You can make this pie in the morning and then stick it in the fridge. When it comes time to bake it, there is no need to bring it to room temperature. Just pop it in the oven. Elaine, what a gorgeous pie, what gorgeous photos! I'm dying to know what that is in the back of the last photo - is that potato salad? With slices of hard-boiled egg? Please tell! What a great way to feed a lot of people! Your pie looks just delicious. Irene: If you click on the link above the photo "Fourth of July recipes from one year ago", that post will give you the recipe for Italian Potato Salad. It has capers and hard boiled egg! I have been resisting buying a food processor for too long. 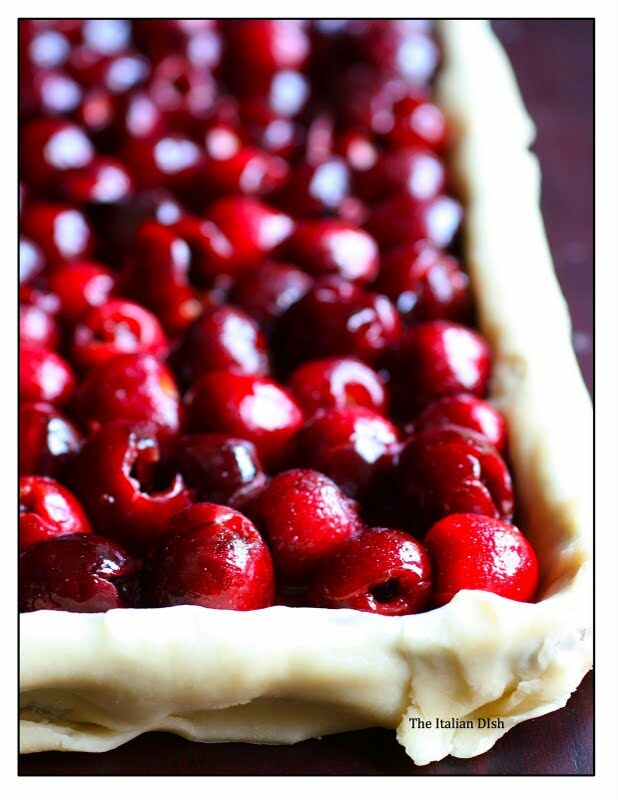 I need to make this pie before cherry season is over (which is too too short!). A cherry-pitting machine?! I need that!!!! Yesterday I spent about 1 hour pitting cherries by hand, using my fingernails as pitters... I think I losened a couple! This tart looks delicious and very juicy! I love that cherry pitting machine. Your pie looks yummy! Oooooo I love cherries. Just did a clafoutis. I appreciate your tips for pie dough. I still get freaked out a bit by it. I make it but I'm never completely happy with it. Also the sheet pan thing...wow, I love this idea. I need to make one more comment. I passed over a manual cherry pitter last week, thinking "I can pit them myself(which I did) and I was thinking how really foodie of me to almost get a cherry pitter and then you have the pitter on steriods. LOL. There is always a gadget we need right? 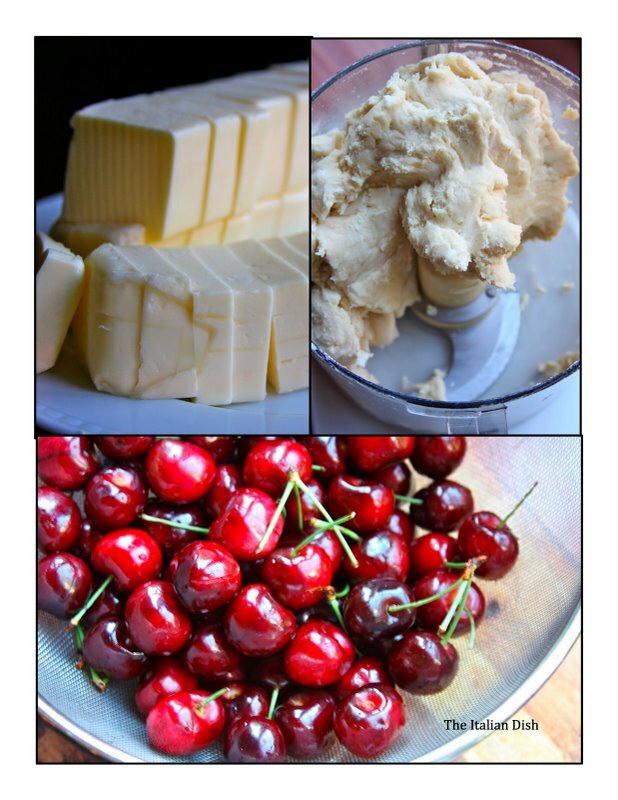 I don't think that I have ever commented before on your blog, but this time I could not resist....cherry pie is my fave and I've never tried this type of pie/tart before. it looks incredible. Stop by my blog sometime too when you have a free moment. Love your blog! 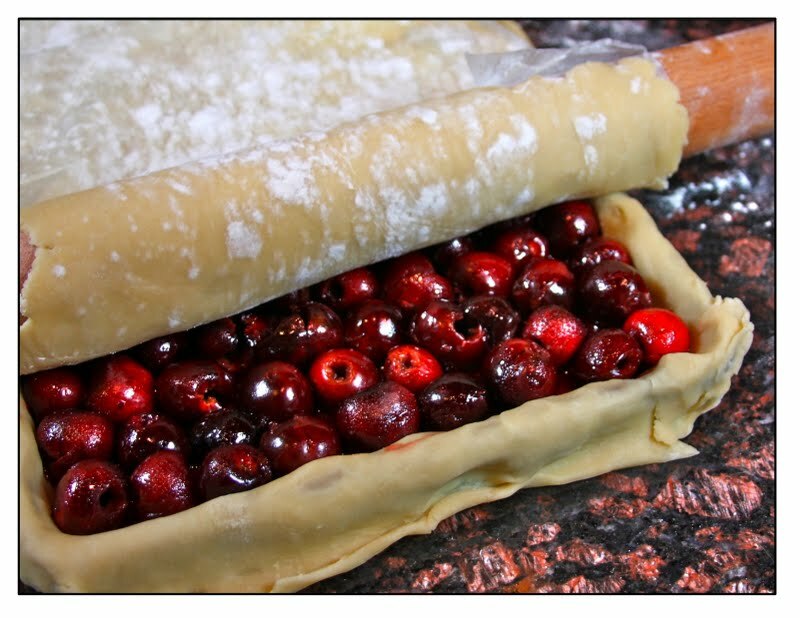 I love this idea and would never have thought to bake a pie this way. What a gorgeous cherry pie and an equally impressive cherry pitting gadget you have there! I am so making this for the 4th! A perfect dessert for the 4th! My mom just bought a cherry pitter and can't stop raving about it! Now I want to get one and make this slab pie! It's so festive! Looks so yummy and patriotic! You make it seem so effortless!!! 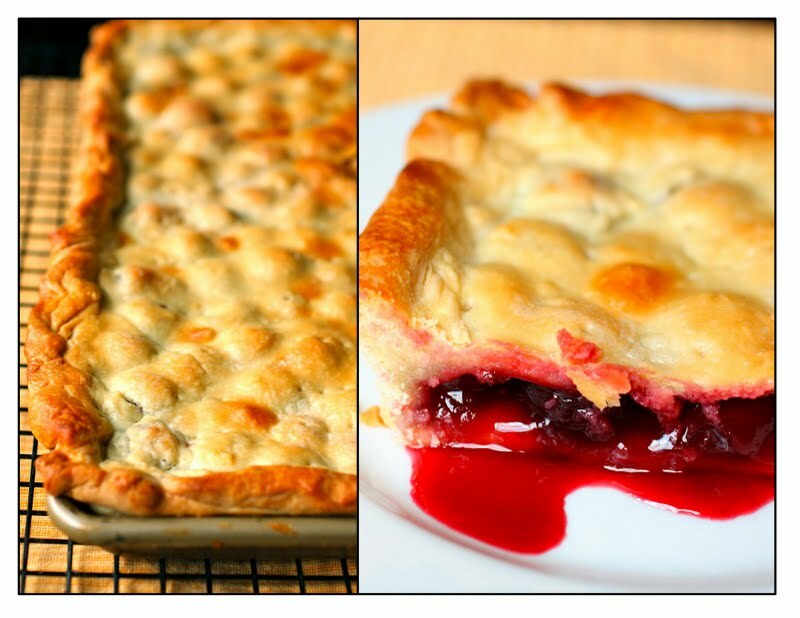 My hubby loves cherry pie and yours looks splendid! I'm going to surprise him and make for the holiday! Happy 4th of July! You have the best kitchen gadgets! That pie looks amazing, that last photo did me in! Any suggestion about the kind of cherries? usually, for cherry strudel I use ripe black cherries, because the flavor and the taste is well indicated for the desserts. My mother make a apple square just like this for a food sale for the church every month and you can use raspberry or lemon too.